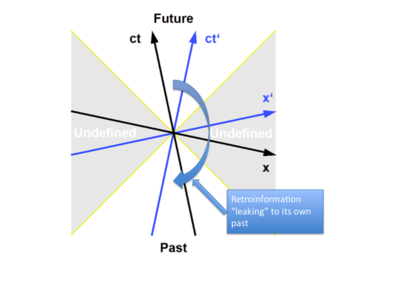 The Leaky Future Conjecture (LFC) asks “What if nature were able to leak information from the future to its own past?” Although human-like time travelers are standard fare in Science Fiction, the conjecture makes no presumptions about what form this communication might take. A Leaky Future could take the form of a stream of bits of information, perhaps as a stream of electromagnetic radiation. The transmission bit rate of this information could be much slower, say, measured in bits per year or centuries. It could operate at very small scale, such as DNA replication, or at the very large scale, such as the sun’s solar cycle. Why do I blog this? this is a notion I was aware of but not under this name. Next Next post: "Seven Warning Signs of Bogus Science:Those seven warning signs are:Discoverers make their claims…"